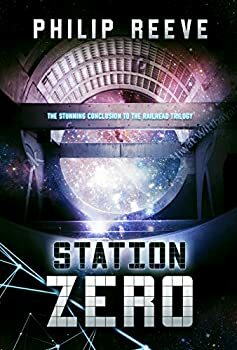 With Station Zero (2019), Philip Reeve brings to an end the RAILHEAD trilogy begun with Railhead and Black Light Express, and if it’s not a perfect conclusion, it’s pretty darn close, leaving you at the end with a sense of satisfying, even gratifying, resolution tinged with a lingering bittersweetness that makes the final result all the more richly rewarding. With this Cosmic Railroad trilogy (not an official title) and his earlier PREDATOR CITIES/MORTAL ENGINES work, Reeve has served up three of the most inventive and compulsively readable YA series of the past decade or two. The startlingly original premise of his earlier series was the idea of “traction cities” that gobble up smaller ones, a municipal survival of the fittest world. Here, the core idea, just as wonderfully fantastical, is a network of sentient AI trains crisscrossing the universe on tracks that run through K-gates leading to other worlds (warning, some inevitable spoilers for books one and two coming). In the first two books, we learned that humanity had not, as they’d long believed, built the network themselves. Instead, it was a mysterious powerful figure known only as the Railmaker, whose motivation for creating the railways remains unknown. Also revealed was that the Railmaker was destroyed and his gates connecting the human part of the network to alien sectors was shut down by super-AIs called Guardians, who were following their ages-old prime directive to protect and guard humanity against perceived threats, which they believed unfettered access to other worlds and races to be. At the end of Black Light Express, a young thief/railhead named Zen and a “moto” (sentient android) named Nova open up a line to the alien part of the network and Nova heads into the Black Zone to seek the Railmaker, or at least knowledge of it. Along the way, the Network Empire controlling the lines split, with two different Corporate Families each controlling half the network. One of those rulers is Empress Threnody Noon, a quasi-friend of Zen’s (at least, they adventured together if not always aligned) who controls the side connected to the alien worlds. At the start of Station Zero, an uneasy peace holds between Threnody and Emperor Elon Prell, who controls the other half of the Network. Prell is a xenophobe who believes contact with alien races will destroy humanity, and he desires nothing so much as to send his wartrains into Threnody’s territory to kill her, unify the Empire again, and destroy the newly opened gates to non-human space. All he needs is permission of the Guardians, but there is disagreement amongst them as to the correct path to take and so for now, Prell can only wait and pretend to negotiate for lasting peace with Threnody, who agrees to meet him for that purpose. Meanwhile, Zen has received a message from Nova, and after managing to escape from Threnody’s watchful security, he reunites with Nova, who tells him she thinks she’s figured out that the Railmaker is not actually destroyed and that the two of them may be able to bring it back, though both the Prell Empire and the Guardians stand in their way. The plot, as is typical of a Reeve novel, moves along quickly, never flagging and always with an excellent sense of balance between action scenes and quieter, character-driven moments. The chases, fights, battles, escapes, tense standoffs and sneak-ins that pepper Station Zero never go on too long (say, like a movie car chase often does), while the more intimate moments between characters, or within a character during a moment of introspection, similarly are just as long as they need to be without bogging the story down. In addition, Reeve offers up a few nice twists, probably more so for the YA audience than adults, though they aren’t any less entertaining or moving for maybe being seen in advance. The characters, whether they be human (Zen and Threnody), motorik (Nova and Flex), or train (Ghost Wolf and Damask Rose) present themselves as fully fleshed out (only the first two literally) creations, complex and complicated, flawed and inspiring. Reeve doesn’t present his protagonists as simply “good.” More than a few times I winced at an action performed by one of these characters. (Seriously. I actually winced. Even recoiled from the book at one point.) Nor does Reeve let characters off the hook for past actions. Zen’s involvement earlier in the series in the crash of a train that killed the train itself and a number of people haunts him — both his nightmares and his decisions, and when, at one point, he thinks, “’I’m going to die here,’ but it didn’t matter, because he knew he deserved to die. He had known it since the Noon train died on Spindlebridge. He would die here doing this … and that would pay the debt he owed,” it’s absolutely heartbreaking. That same emotional weight bears down on the reader as well with regard to the love between Zen and Nova across multiple scenes for multiple reasons. And when I refer to the trains as “characters,” I’m not exaggerating. Several of the most moving moments involve only trains, which tells you something about Reeve’s skills as an author of the fantastic. What Zen Starling had told her was true: Motorik were people every bit as much as humans were. And aliens are people too, she thought, looking form the placid Motorik who walked beside her to all the weird passers-by. A party of the Ones Who Remember the Sea flowed across the street … on their land-adapted tentacles … A small colony of Hath had planted themselves in the shallows, membranes spread to catch the night breeze … along the beach, wormlike Chmoii danced like the diagrams of complicated knots. Everywhere will be like this one day, Threnody thought … Chmoii and Herastec would be as common everywhere as humans and Motorik … That was what made it so important that the Noons … did not let Elon Prell roll in and shut humans off from their alien neighbors again … Threnody was enchanted by the night. Hard not to read those lines and not hear their echo in our own current debate over immigrants and refugees, or in other scenes, similar parallels involving debates over gender or sexuality. Reeve’s answer to this fear of the other is all the ways in which he presents different types, whether they be aliens, robots, or trains, as all engagingly, understandably, movingly “human,” our differences merely cosmetic trivialities. Or maybe, our differences are merely washed out in the flood of all the different ways we have of being even ourselves. It’s almost a cliché to say of a YA book that the goal of the protagonist is to “find themselves.” But Reeve eschews the tritely familiar here, because he calls into the question the idea of a single “self.” Or as Nova puts it. Human beings live loads of different lives at once. They always have. One life in the real world and the others in daydreams, in memories, in stories, in games. Lots of lives all going on all at once, and all of them real in some way or other. You humans have so many different versions of yourself, it’s all us poor machines can do to keep up with you. That’s a nicely heady thought in a YA space opera. Though of course, this being sci-fi/fantasy, it doesn’t have to only be in the head, but instead, because the abstract/metaphor can become literal in this genre, the concept can present itself to the reader in all sorts of wonderfully inventive, fantastical, and above all entertaining ways. I did mention at the start that Station Zero wasn’t quite “perfect,” so I’ll just note a few minor issues. One is that the book is less expansive than the others, and so we see fewer alien worlds or aliens themselves, truly a loss given how richly original they were in the earlier books. A few characters and plotlines get some short shrift, such as Emperor Elon or a captured Krait warrior (the Krait were the fierce alien antagonists the humans warred with in the prior novel). And the bittersweetness of some of the storyline is perhaps too quickly, well, sweetened, at the end. But these were as mentioned relatively minor complaints and were certainly outweighed by the book’s many strengths. Strengths which carry through the entire trilogy, making it easy to highly recommend this series. Published in February 2019. What happens after the adventure of a lifetime? For Zen, it’s a safe, comfortable life of luxury. But it’s not what Zen wants. He misses the thrill of riding the rails, of dodging danger, and of breathing the air of different planets. Most of all of course he misses Nova ― lost to him forever in a distant world. But then one day a mysterious message arrives, and that’s all Zen needs to head right off, ready for anything. Except that no one could be ready for what he finds… Thrilling, thought-provoking, and breathtaking, this finale to the Railhead trilogy weaves a web of wonder, full of characters and events you will never forget.